hello all, i would really appreciate your help, i have used the search function, but i am still not completely understanding. so, there is a company that is printing t-shirts for me. i have to send them images of the exact size as they would appear on the shirt. before, i was using pixlr, a free online image tool, to resize, make different colors, variations, so forth. i would order samples of the shirts, some turned out great, others looked different from what we thought. as in the colors werent as bright, images could have been a little sharper. so after i emailed them, they had shown me a screen shot from their computer, and they circled the resolution box and said "your dpi is at 72, it needsd to be a minimum of 150." so, how can i increase the dpi of existing images? what are my options here? i have recently downloaded gimp, and i am changing the resolution, but i am afraid this is not working, i think it saving the image to a proportional size. it shows it changing the size in inches when i adjust the resolution to a needed value. however, when i go under scale image, it shows the image as the correct size, and it also shows the res i set previously under the other option. im so lost right now. can i do this in gimp? if not, what are my other options? does photoshop do this? i cannot afford photoshop right now but it may be my only option. The printer almost certainly wants images in CMYK format rather than RGB that Gimp produces. Explore the possibility of creating your designs from scratch (at 300 ppi) using free application Krita. Quote: ..they had shown me a screen shot from their computer, and they circled the resolution box and said "your dpi is at 72, it needsd to be a minimum of 150." can you share this screenshot with us. Quote: ..how can i increase the dpi of existing images? what are my options here? 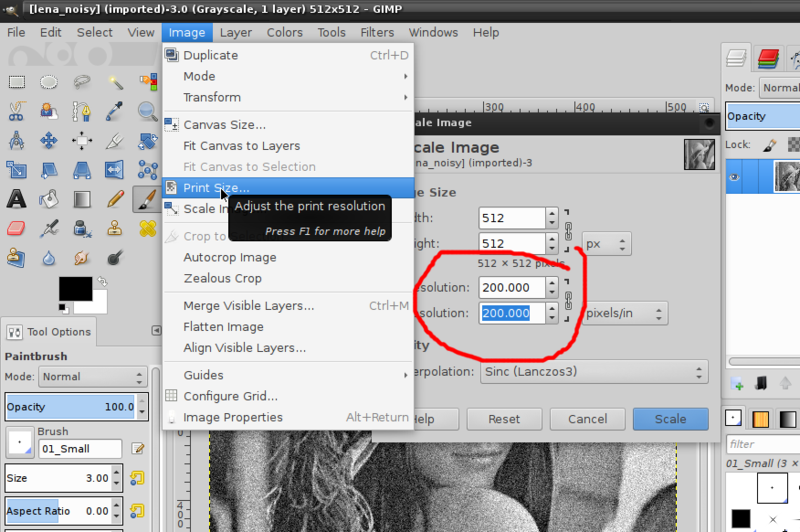 i have recently downloaded gimp, and i am changing the resolution,..snip.. when i go under scale image, it shows the image as the correct size, and it also shows the res i set previously under the other option. im so lost right now. can i do this in gimp? if not, what are my other options? does photoshop do this? i cannot afford photoshop right now but it may be my only option. How can you tell the difference? Go into view and un-tick dot-for-dot which will show the comparitive size (zoom level being the same) both images 512 x 512 pix. If your printing co. does not recognise the setting then maybe some other co.? 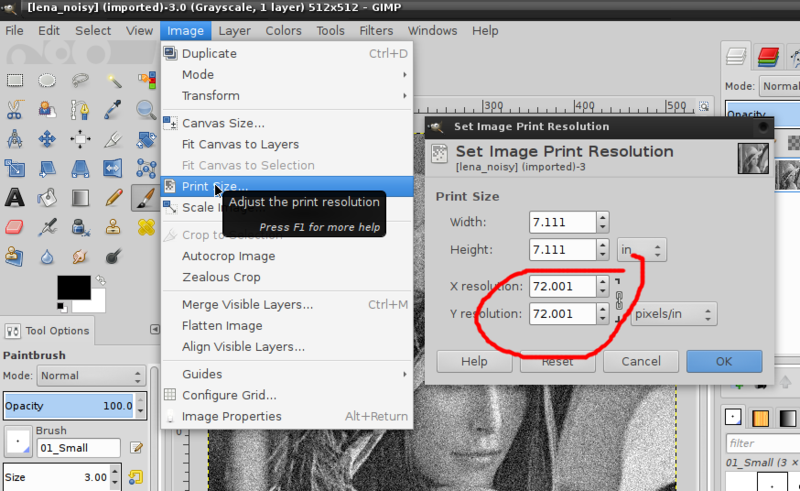 So increasing the DPI without increasing the size in pixels reduces the print size. Image>Print size won't let you change the size in pixels, so when you change the DPI the print size changes correspondingly. 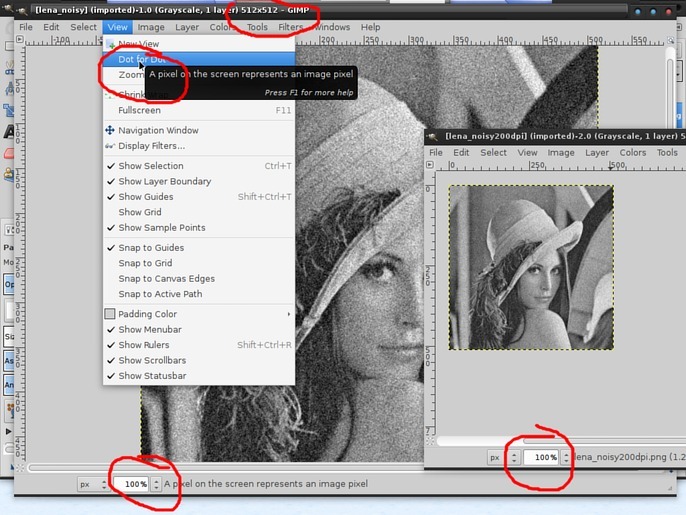 In the Image>New dialog, if you set a specific DPI and enter the required print size, Gimp will compute the size in pixels for you. thanks for the response. so, just to make im clear on what you are saying, i cant do it from the print size option without changing the size, which is not an option for me, since my files have to be the exact size that they would appear on the shirt. what about under the scale option right below? i can change width/height to desired number (which is usually 960 x 960 or 10 x 10 in) and change the desired resolution to the 150-300 range. Is this not what I want? when i have been saving images in the past on pixlr and uploading them to the print shop's site, it is the correct size. i tried a min ago making the changes like i just described above and exported as png, which are the type of files they prefer. when i hovered over it in the file folder, it showed it as 960 x 960, which to my understanding is 10 x 10 inches. i hope i am doing it right. also, i did not see image>new dialog under the menu. can it be found somewhere else? thanks. All colors that appear in the artwork will be printed. If creating a 150dpi or larger PNG (at actual size) file isn't possible, use other file formats like Photoshop, PDF or TIFF. Unfortunately the the dpi is also to low at 72: http://screencast.com/t/7mF8ixUloqgh Our minimum dpi is 150. That sounds like a very reasonable printing company, wish they were all like that. You have your answer from Ofnuts on image size. FWIW, Stick to png with a transparent background. For your design, something like that would scale up a little, but best to start with a larger canvas in the future.